Enduring Sun, a line of spreads and tapenades from Lancaster International Trading, will be distributed in the 2007 Tony Awards gift bags. The exciting news created a flurry of activity as 2,000 samples were prepared and shipped out along with 3x5 index cards containing facts about the delicious products. What is truly unique is the opportunity Enduring Sun is providing for those in third world countries. Company founder Myron Stoltzfus created Enduring Sun with the premise that his gourmet products made with heirloom variety ingredients produced jobs and fair income for third world farmers. However, celebrities aren’t the only ones who can enjoy this fair trade food: Enduring Sun is available in local supermarkets and online at www.enduringsun.com. North Star Marketing was recently named interactive and PR agency for Fenner Precision, located in Mahneim PA. Fenner Precision is the industry leading manufacturer of polyurethane timing belts and rollers, Fenner Precision is also known for their rubber reinforced and un-reinforced flat belts, polyvee belts, PTFE/phenolic composites and glass/silicone composites. Their products are most widely used in ATM machines, commercial photocopiers, personal printers, power tools, and home appliances. Constructive Advice, a publication produced by North Star Marketing for High Construction, has won a 2006 APEX Communications Award. Constructive Advice deals with issues related to building or renovating a commercial, manufacturing, education, retail, health care or hospitality facility. Leading snack food company and North Star PR client, Snyder's of Hanover, was featured on NBC's TODAY show on Friday, September 1st. 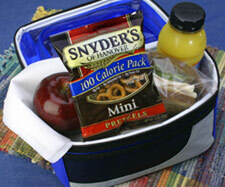 Snyder's 100 Calorie Pretzel Packs was featured in a special Back-To-School segment. This great product has only 1 gram or less of fat per serving, with 0 grams of trans and saturated fat. And of course just 100 calories a pack! Snyder's 100 Calorie Pretzels Packs are available in a variety of their popular pretzels, and perfect for that busy family who still wants to take time to eat healthy! North Star has recently completed a variety of projects for the local company, including package design, sell sheets, and websites for their CandyCot Dried Apricots and Enduring Sun jams and tapenades. Look for these great products in a store near you. Garrod Hydraulics, a leader in the repair and remanufacuring of hydraulic cylinders, and industrial hard chrome plating, has teamed up with North Star on its branding and marketing efforts. A new website, and brochure are already complete, with more to come! Click here to see the KiplingerForcast section featuring Flinchbaugh.